It will be a day of firsts for Aussie Rules in Townsville on June 15th. Not only will an historic AFL Telstra Premiership fixture be played, but North Queensland’s largest city will also host the North Queensland versus South Queensland clash for the first time. The Gold Coast SUNS and St Kilda match will headline the day of footy at Riverway Stadium with the North v South rivalry clash scheduled to commence immediately after in the 4.30pm twilight timeslot. 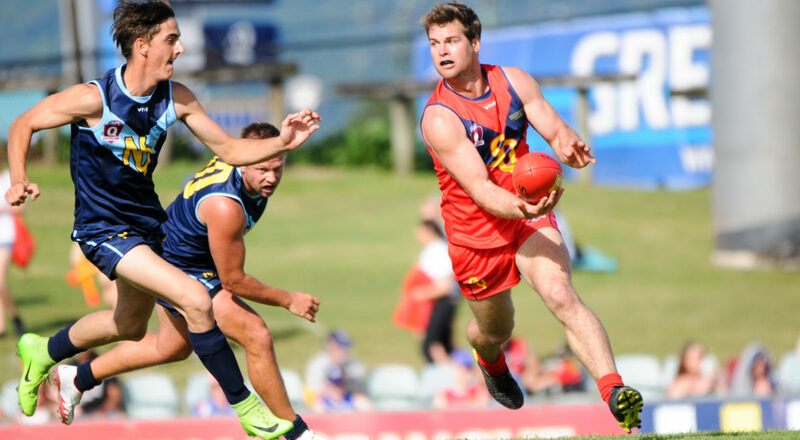 With an anticipated sell out crowd for the main event, AFL Queensland are hoping that a large portion of the crowd will enjoy the festivities of the day and stay on to watch the best local talent on display in the North Queensland team. Last year three Townsville players were part of the NQ team and this year they will be hoping to increase that number on home turf. This will be the sixth installment of the annual intrastate clash, with the northerners keen to put a stop to the recent southern dominance. NQ jumped ahead in years one and two with wins, but since then its been all SQ’s way. Townsville presents a great opportunity for North Queensland to level the series at three all. The Southern team is made up of players from the Queensland Football Association, AFL Darling Downs and AFL Wide Bay Leagues, whist their northern counterparts draw players from five competitions spanning the coast line from Gladstone right through to Port Douglas and out west to Mt. Isa. Former St Kilda and Brisbane Bears player, Danny Craven, returns for a fourth term at the helm of the SQ team and will again be ably assisted by Coorparoo mentor Rory Lake. Springwood’s Brad Pollock and Caloundra’s Steve Moody will round out the South Queensland coaching panel. Highly successful Port Douglas coach, Brad Cooper, returns for a third time to lead North Queensland and will again be supported by 2018 AFL Townsville premiership coach Jamie Fogg. Former Melbourne AFL star and current Cairns City Lions coach, Aaron Davey, and four time Yeppoon premiership coach Mark Wallin will join the North Queensland coaching group for the first time, Townsville Academy coach Darren Lange completes the coaching group in the role of Development Coach. Queensland Australian Rules Hall of Fame Member, John Durkin, who served for many years as president of AFL Townsville and is now the official Ambassador for the North Queensland team, said he was over the moon to see the representative clash being played in his home town and looked forward to welcoming his opposing Ambassador and good friend Michael ‘Tiger’ McCormick to Townsville. “I’m a huge advocate of this program, as it exposes our regional players to much a higher level football. “It’s fantastic we get to bring it to Townsville as part of a historic day of footy for our code. “I’m looking forward to hosting Tiger and his team and hopefully we can get the bragging rights back on home soil”, Mr Durkin said. “It’s a high class facility at Riverway and I have no doubt the players will relish playing there in front of a large crowd. “Our city has done it tough of late, so it’s great to be able to put Townsville on the map in a such positive light through footy”, Mr Durkin added. Both teams will announce initial squads in May before final teams are announced on Monday June 10.